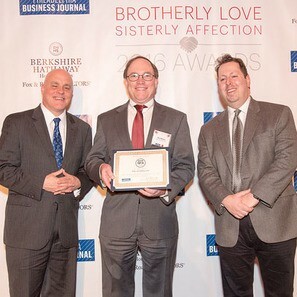 White and Williams was honored at the Philadelphia Business Journal's inaugural Brotherly Love and Sisterly Affection Awards Dinner on Thursday, April 7, 2016. The event recognized partnerships between non-profit and for profit organizations that help the city of Philadelphia. White and Williams was specifically recognized for its significant number of pro bono hours donated throughout 2014, which ranked highly among local law firms. Pete Mooney, Co-Chair of the firm's Pro Bono Committee, accepted the award on behalf of White and Williams and is pictured with Philadelphia Business Journal Editor Craig Ely and reporter Jeff Blumenthal. The awards dinner was held at The Ballroom at the Ben in Old City, Philadelphia. Our lawyers are proud to have established a tradition of pro bono service and annually donate thousands of hours of free legal services to both individuals and non-profit organizations for a variety of causes. Learn more about our pro bono service and the organizations with which we work here. If you would like to receive additional news alerts, event notifications, or correspondences pertaining to this and other industry-specific topics, please sign up by visiting the Contact Us page. Be sure to provide your contact information, including email address, and list the areas of practice or industries for which you would like to receive information. This correspondence should not be construed as legal advice or legal opinion on any specific facts or circumstances. The contents are intended for general informational purposes only, and you are urged to consult a lawyer concerning your own situation with any specific legal question you may have.